In your HubSpot account, navigate to blog, email, landing pages, or website pages. In the dashboard, click the name of the blog post, email, landing page, or website page you'd like to edit to access the content editor. Click the rich text module where you'd like the image to appear. In the rich text toolbar, click the Insert dropdown menu and select Image or click the image icon insertImage. In the right pane, select an existing image from your file manager, or click Add image to upload a new image from your device or a URL. 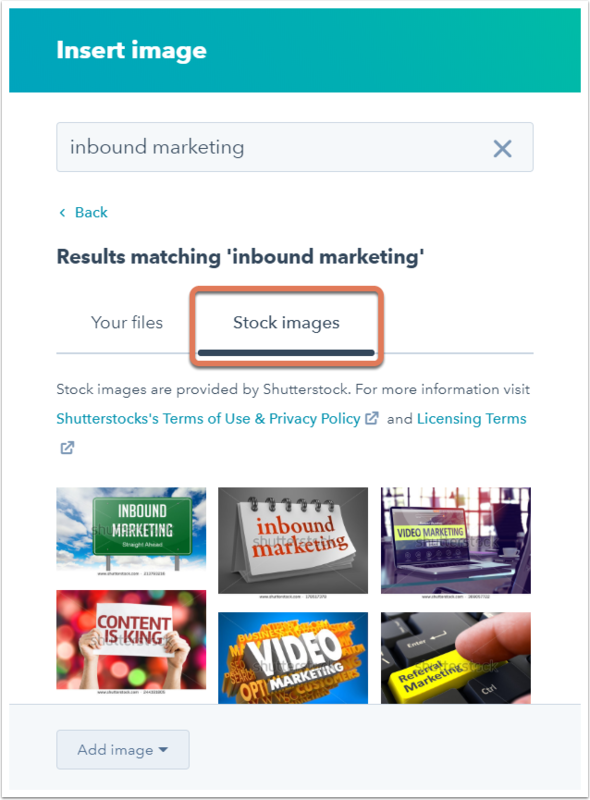 To use a stock image from Shutterstock, click into the search bar and enter a search term, then press the Enter key and click the Stock images tab. Click an image to review its details, then click Insert to add it to your social post. Please note: only png, ico, bmp, jpg, and gif image file types can be embedded in marketing emails. Use the preset Alignment options to wrap text around your image to the left or right, center it between paragraphs, or set it as a full-width image within your text. Use the Width and Height arrows or enter a pixel size into the Width and Height fields to adjust the size of your image. Use the Spacing section to adjust the amount of white space that appears around your image. In the Alt text field, add descriptive alt text to your image to tell search engines what it is. Make additional changes to your content as needed, then click Publish or Update to take your changes live, or click Save to save your changes in draft. To remove an image from a rich text module, click the image, then click the trash icon delete in the top right corner of the image or press the Delete/Backspace key on your keyboard. To replace the image, follow the instructions above.